Tip: Download the Colombia map to your smartphone and save it as image so you can use it offline. Your Colombia tours should include exploring the famous Tayrona National Park, where you will see the most unique animals, such as Toucans, monkeys, parrots, sloths and the coati as well as tropical beaches and tall palm trees. Medellin is Colombia’s second-largest city and the capital of Antioquia. This formerly no-go city has experienced positive changes in recent years and is now a must-visit destination, especially for the Colombia backpack travellers. Some of the top recommended places to visit in Medellin include the train station, which is located in the eastern part. This station is within a site that has scientific and cultural importance due to its proximity to the University of Antioquia and the Botanical Garden. For a completely unique experience, take a ride on a cable car from Santo Domingo to Parque Arvi. You can access the gondola to Santo Domingo with your metro card. Don’t hop off the gondola at the first stop; stay until you reach the top. There are in total 3 stops. Go to the viewing platform – see iPhone image. Keep in mind that this is a poor area so keep your camera and smartphone hidden from view otherwise they will get stolen. It is best to visit this place during the day only, and on the weekends, it tends to get less crowded. There is a free walking tour, which you must sign up for beforehand but can cancel it easily without problems. Medellin is home to an interesting memorial museum near St. Antonio. Another museum in Medellin is called Museum of Antioquia, but don’t pay 18,000 pesos to go there as you will find the same one in Bogota for free. To explore Medellin’s top sites, buy a metro ticket covering 10 stops (about 15,000 pesos) as you won’t have to queue up for tickets at the rush hours and weekends. Guatapé is a municipality town and part of Eastern Antioquia. This city is 80 kilometres from Medellin and well-known for its breathtaking lakes, where you can spend a day enjoying lots of water-based activities. The number one reason for visiting this stunning town is to climb the 740 steps to El Peñón de Guatape or the Rock, where you can enjoy the most beautiful views of the city from the top. Guatape has to be one of the most colourful and vibrant towns in the whole of Colombia. Most houses are brightly painted and decorated, which give the entire place a surreal atmosphere. This town is home to a floating park on the lake (Comfama Recreation Park), located on the road between the rock and the town. On a hot day, you can rent a kayak and explore the surrounding lake. To reach Guatapé from Medellin, take the blue line A train to Caribe station. Upon exiting Caribe station, cross the bridge and walk to the bus station where buses to Guatapé depart from. A one-way ticket only costs 14,000 pesos and once you reach Piedra, you can climb the 650ft rock for a further 2,000 pesos to reach the city of Guatapé, so your return ticket will cost 32,000 pesos in total. The bus ride will take around 1 or 2 hours depending on traffic. Entry to the Piers del Pinoil rock costs 18,000 pesos. We recommend that you take an early bus to Guatapé, especially on weekends and holidays as this town is popular with the locals too plus you won’t have to queue up all day at the rock. Climbing the rock is a must because you’ll be able to enjoy the best views from the top. 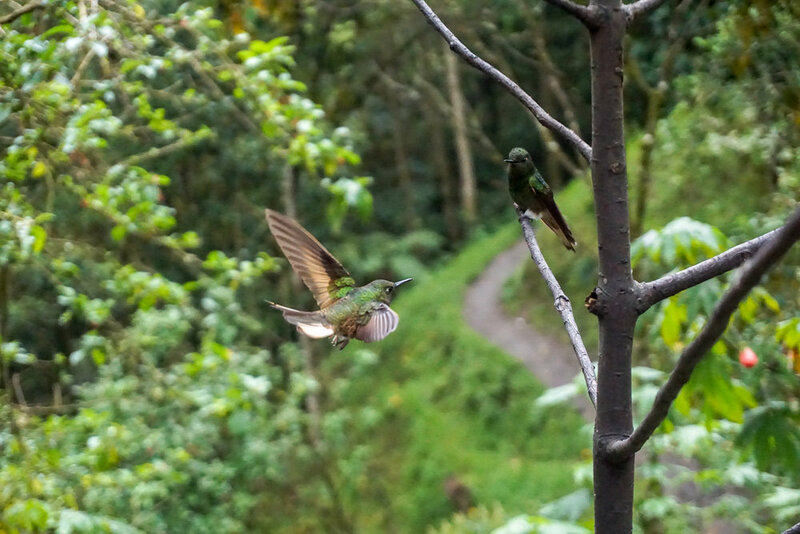 In Guatapé, there are lots of exciting activities you can take part in, such as riding a motorbike, taking a boat tour, walking around town and having lunch; and for the thrill seekers, why not take ride on a zip line wire that starts from the hill and takes you all the way to the beach. Santa Marta is situated on the Bay of the Caribbean Sea, 992 km from Bogotá. This ancient city is the fourth largest town in Colombia and boasts some of the most stunning beaches in South America as well as amazing views of Sierra Nevada Mountains. The hotspot for the best street music, bars, and restaurants has to be Carrera 3 and the surrounding. You will even find some top-rated Italian restaurants here. Getting around the city can be done with a taxi but if you’re travelling further outside town to Tayrona or the beaches, for example, it’s best to catch a bus. Although the beaches are beautiful, they are difficult to reach as you’ll need a permit. Rodadero Beach is good if you want to relax after a day’s hike and it’s easy to reach. Just catch the bus that departs from most stops in the city and only costs 1,600 COP. Uber doesn’t work in Santa Marta and for some reason, taxis only go as far as the city centre and not beyond. We wanted to take a taxi to a beach outside of Santa Marta, which was approx. 15 mins drive, but none of the taxi drivers wanted to take us there. Buses are a better alternative and quite prompt too. Santa Marta is the starting point for the Lost City trek tour. Most tourists visit Santa Marta because of the famous Tayrona National Park. It is from Santa Marta that you can easily reach Cartagena and Minca. If you have an extra day to spare, consider exploring Minca. This is a refreshing village in the mountains just 45 minutes away from Santa Marta and an ideal place for hiking. This quaint place is a great stopover before you head to Tayrona National Park for some intense walking or just taking a break for a day. The drive to Minca is not only scenic but it eventually leads to the spectacular ocean at the distance. To get a complete perspective of this small village and enjoy the views from the top, follow the Los Pinos trail uphill, which is a 3-hour hike before relaxing at Casa Elemento. Once you get to the top, you will see birds, waterfalls, and forests. You can always take a moto-taxi back to Minca afterwards. The park is highly popular, especially in high season (December, January, July, and August). Moreover, the beach gets very crowded so start early and enjoy the first couple of hours in the morning without many people around you. If you wish to stay overnight, you must book your campsite or hammock at the park’s entrance – but it’s on a first come, first served basis. The most popular campsite is at Cabo San Juan because it’s stunning and tourists love it. You can enjoy the beach in peace in the afternoon when most of the tourists leave to catch the bus. Tip: sleep in the hammock by staying overnight in a house on the island. You can listen to the sea and enjoy the breezy air since the house only has a roof without windows or door. You should also be prepared for mosquitoes as they will have a field day feeding on you in this house. A mosquito net is a must to avoid getting bitten! Start early in the morning, walk to the beach when no-one is there yet. Once the tourists arrive, head to another less crowded beach like the second or third one behind the main beach of Cabo San Juan. Relax there for a while before heading back by 3pm as the park closes at 5pm. Or start early in the morning so you can book the best campsite at the park entrance. Walk in the park, set up your tent and enjoy the quiet beach in the afternoon. You can stay overnight here. The next morning, if you love hiking, follow the return track through the indigenous village of Pueblo Chayrama. But keep in mind that the track isn’t easy at all. It’s steep and tiring so you will need really good hiking shoes with proper grips. This hiking trail is less popular with tourists since it’s more exhausting but you will pass through an indigenous village. It would be a shame to miss out on such a hiking trail, especially if you are fit and healthy and staying in the park for two days. The town of Charaima with its original 250 terraces used to be inhabited by about 2000 people between 450 and 1600 AD. Charaima was discovered in the 5th century and was one of Tayrona's main towns. The residential and communal houses were built on the terraces, and there were clear boundaries between living and working areas. None of the original huts have been preserved, but the stairs that lead to the terraces are in good shape and give an impression of the size and structure of the settlement. The indigenous Kogi people who live here are the descendants of the Tayronas. There are also two huts that the Kogi built in Charaima village, where members of the tribe offer things like bags for sale. This leaves a rather different impression of what one would expect from Kogi settlers. On the other hand, you cannot blame the Kogi in Pueblito who have such a different outlook on life: They are photographed by lots of tourists day in, day out and love being admired by visitors – Life is certainly more beautiful in their eyes. If you're not planning to visit the Lost City trek, this charming village would be a good opportunity to get to know the Kogi people and how they live. You can take a walk at normal speed and capture many pictures/videos along the way. Why not take a break and eat some fresh coconuts. It should take you no more than 2-2.5 hours to reach the famous beach of Cabo San Juan. Note: you will need the same amount of time to get back so you will be walking up to 5 hours, which can be done in one day. However, take into account the stopover for fresh coconuts, spotting monkeys and other animals in the trees, enjoying the beaches along the track for a break…. There is only one hiking track, but sometimes it’s split into two without any signs or maps. When this is the case, always stay right next to the beach and don’t turn left, which is what we did by accident. We had to make a 30 mins detour walking through the forest instead of the beach. If you get tired of walking, you can always take a ride on a horse. You can take the bus from Santa Marta to the park. The bus is the best option as it only costs 7,000 COP. There is no need to wait in the bus stop for long as it operates all day and will take you directly to the park’s entrance. After entering the park, your bags are checked and there are mini buses that will take you a little further into the park for around 6,000 COP. This is something you should definitely do as we saw a lot of people walking through the street and there is nothing special to see along the way. What’s more, you will have to walk in the park anyway so spare the time and energy you have by taking the mini bus into the park. Whether you love swimming in the relaxing Caribbean Sea or scuba diving in the spectacular reef, the beaches of Colombia have everything you desire. The Caribbean Sea has some of the softest sands and huge rock formations (not forgetting the iconic palm trees) for visitors to enjoy. Why not rent a hammock or an eco cabin and spend a peaceful day basking in the sunshine in one of Santa Marta’s beautiful beaches. We recommend that you spend a day relaxing here to preserve your strength before leaving for the Lost City trek. Ciudad Perdida is a lost city tucked away in the mountains of Northern Colombia. This ancient city is deep in the jungle and has been lost for centuries. In 1972, it was re-discovered by tomb robbers in the area. The pre-Colombian Tayrona's history spans back to many centuries ago and the earliest evidence of humans in this part of the world was discovered around 800 CE. When the first Spanish settlers came to this region in the 1500s, tension started to escalate between them and the Tayronas, thus resulting in direct confrontation. As a result, the natives had to move their homes to Nevada Mountain. This move helped them avoid becoming the victims of the Spanish rule. The Tayronas don't live any differently today as they have done in the past. They live in villages with circular houses made of stone, mud, and palm tree leaves. They only wear pure white clothing because they believe white is the symbol of purity and Mother Nature. Colombia's Lost City was created by the Tayrona settlers on the northern slopes of Santa Marta's Sierra Nevada back in 800 AD. The natives who built the site called it 'Teyuna’. The City of Perdida has a vast history that stretches back to more than 650 years before Machu Picchu (an ancient Inca city). It was originally a ceremonial centre and only became known to the outside world in the 70s when tomb robbers discovered gold at the site. The Lost City of Colombia has an architecture based on mysteriously designed terraces and one-of-a-kind disposition that's never been seen before in any other ancient city in America. We booked our 4-day trekking tour of Ciudad Perdida through Expotur company and were highly satisfied with their service. The tour was well-organised and the food was OK considering it had to be carried all the way to the Sierra Neveda jungle. The beds were well-equipped with mosquito nets and although we were warned against bedbugs, we were lucky not to have any in our beds. Cartagena is a major Colombian port founded in 1533. This town is located on the northern coast of the Caribbean. Cartagena is one of the first Spanish cities founded in South America. The first Spanish settlers who came here to start a new life built their mansions and claimed it as their homeland. By the end of the 16th century, the Spanish decided to build a wall and a fortress in order to protect their wealth. During that time, the city was America’s largest and a hub for the slave trade. Visitors can explore the many colourful streets of Cartagena’s Old Town, a UNESCO World Heritage Site, thanks to its huge churches and cobbled alleys. In Cartagena, take a stroll through the historic city centre and spot the unique sites along the way. This city is perhaps one of the most popular places for tourists so prices tend to be more expensive. In fact, every few minutes, a street seller wants to offer you something at ‘a special price’. These sellers can get annoying or bothersome as they will even show up at restaurants, thus it difficult to have some peace and quiet without constantly rejecting their offers. Cartagena is a party town where you will find a lot of bars and clubs, with backpackers and loud music everywhere as well as prostitutes… Cartagena is a beautiful city, but rather overcrowded with tourists. It is definitely worth a visit but don't plan to stay there longer than two days. If you want to enjoy the historic centre in peace and quiet, it’s best to go early in the morning and perhaps join a free walking tour or visit Playa Blanca, one of the most beautiful beaches in Isla Barú. Another great idea is to have a drink in café Del Mare at sunset. This place has great vibes and an excellent atmosphere. To get to Cartagena from Santa Marta, take the direct MarSol bus or catch a flight there. We recommend the bus as it will pick you up from the place you are staying and drop you off at your accommodation place in Cartagena, and vice versa. The bus ticket only costs 50,000 COP from Santa Marta to Cartagena as an example. Cartagena has an airport so you can easily get there by plane too. During your travels to Cartagena, consider visiting Playa Blanca for some snorkelling or swimming fun. After all, what could be better than lying on soft sand and sipping on coconut water! Playa Blanca is situated just 40 minutes from Cartagena in the Caribbean Sea. Salento is a municipality and town in the department of Quindio. It is well known for its enormous palm trees and very friendly locals. Salento survives on trout farming, coffee production, and tourists who are attracted to its colourful streets and unique architecture. 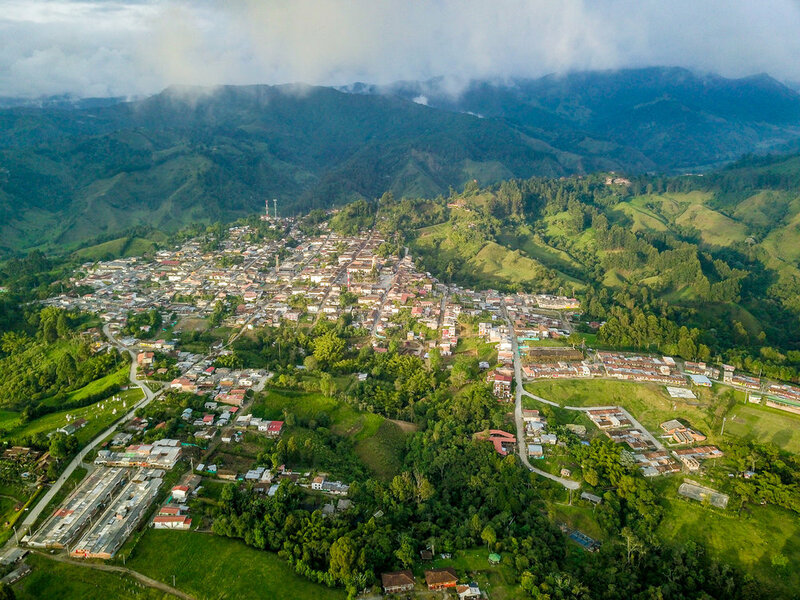 Salento was founded in 1850 and is one of the oldest towns in the department of Quindio. 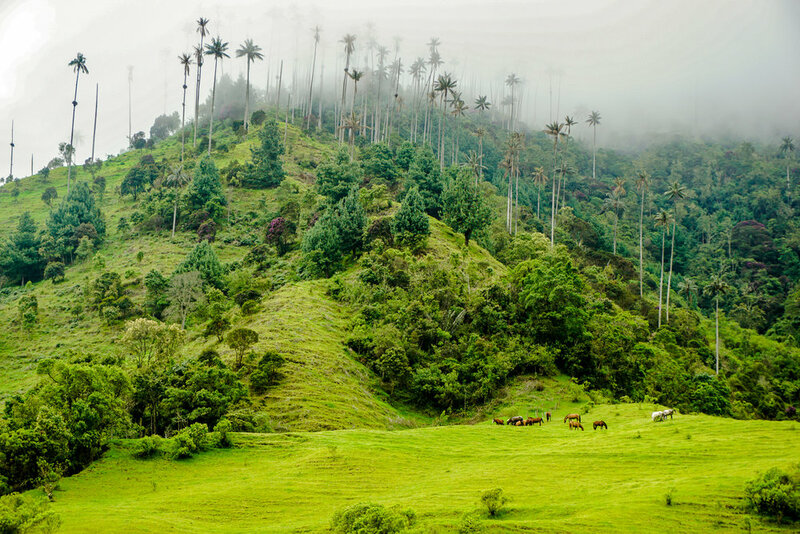 You can do lots of great activities here, such as take a walk through Cocora Valley trek to see the famous palm trees, visit a coffee plantation, or go horse riding. The other great thing to do in Salento is to eat trout. I have a lot of blog posts raving about Colombian trout and wondered what all the fuss was about. Salento’s trout is truly delicious and typical of the region. You can easily find good restaurants by taking a taxi to places like Camino Real (on the Main Street, opposite end of the main square), Bernabe Steak Restaurant, and the fish restaurants, Acaime, Trattoria Concepita and Salentu d'amare. To reach Salento from Cartagena, you can either take a night bus or fly. We took a domestic flight for only €50 per person including baggage to Pereira. From there, it is a one-hour drive to Salento. We can highly recommend the Montana Guesthouse because of its location and facilities. This is a small guesthouse with only 2 rooms, which feels more private and unique. Everything is newly built and huge in size. It offers guests a shared kitchen and living room. There is a large hammock, 2 hanging egg chairs, fireplace, and a hot tub outside in the courtyard for the guests to chill out and relax in and enjoy the amazing views. Tip: Download the Cocora Valley Colombia Map to your smartphone and save it as image so you can use it offline. Cocora Valley is located in the Central Cordillera of the Andean mountains. 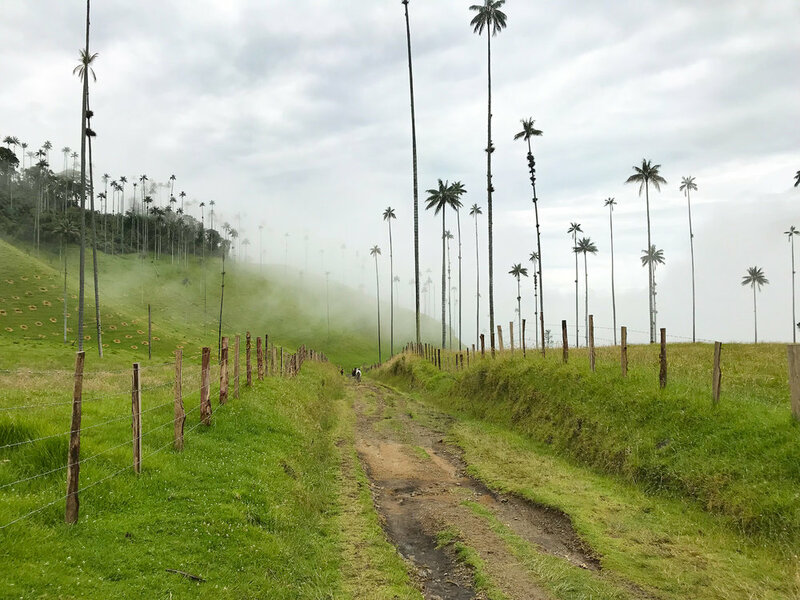 This trek offers stunning views of Colombia’s national symbol, the Wax Palm trees, which are the world’s tallest trees with 60 metres in height. 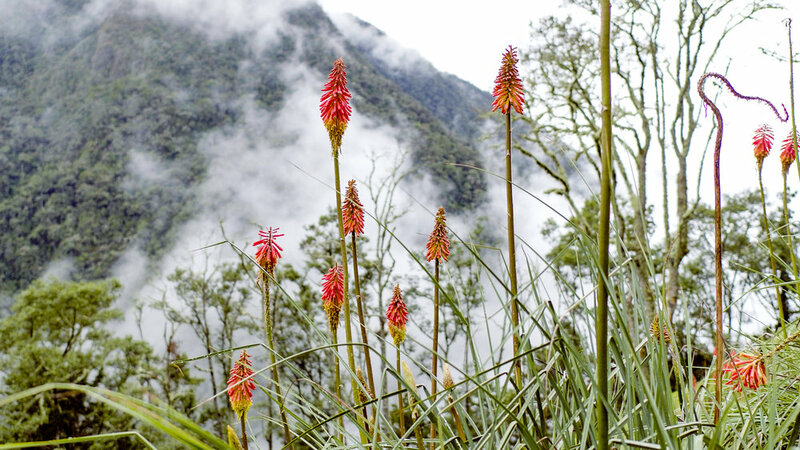 Your visit to Salento must include a beautiful day of hiking in Cocora Valley. To get from Salento to this trail, you need to take a taxi ride of about half an hour before you start hiking. Taxis run all day from the main square next to the Nuestra Senora del Carmen Church in Salento. When you start hiking, walk in counter clockwise direction because in the beginning it will be a steep climb uphill and a very relaxing onward trip, where you will mostly be walking downhill. The views at the end of the track are breathtaking and you will be able to enjoy the landscape as it unleashes right before your eyes as you carry on walking. Another reason you should walk in this direction is because of the chances of rain. You can reach the viewpoints within 30-45 minutes. You can even walk back the same way if it does rain. Once you arrive to the starting point with the 4WD taxi, go directly to Main Street. After 200 metres, the signposted route will appear on the right, where most people start walking from. For a further 10-minute walk down the street, you can follow the route on your right side. There will be a park guide at the entrance, where you will need to pay a small fee. Continue your journey by always following the track. You will see other tracks along the way but don’t go on them. Just continue making your way on the main track at all times. Don’t miss the hummingbird house! It’s a beautiful sight with hundreds of hummingbirds flying around the house to find food. To enter the house, you will pay a small fee, which goes towards maintaining the property and you’ll get a free drink in return. Just take your time here and don’t rush as you will have plenty of time. After all, the return track will only take 1.5 to 2 hours and it’s worth enjoying the experience. The route to the hummingbird house will take around 20 minutes for one way and you have to follow the exact route back. It’s best not to go on the other route as you won’t have enough time. A visit to one of the coffee farms in Colombia is a must. There are some interesting tours that will take you through a journey of coffee production process from start to finish. We can recommend the coffee plantation farm "Finca EL Ocaso", but there are also other coffee farms in the region that are also worth a visit. Just ask your accommodation about the ones they recommend. Since we had a great time in Finca El Ocaso, we can highly recommend it to you. The tour starts with some background information about coffee plantations in Colombia, the different types of coffee available and so on. 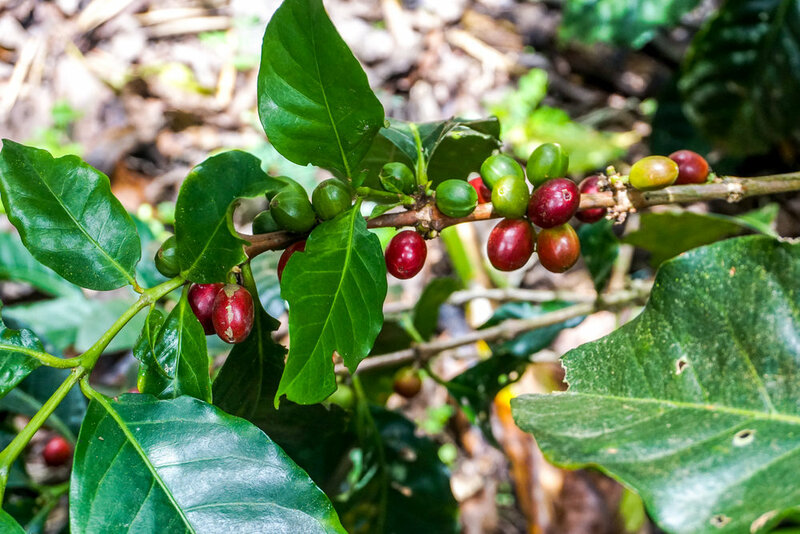 After the introduction is over, you can walk through the coffee farm and pick your own coffee beans, learn what to do with raw coffee beans, from drying them all the way to the roasting procedure. By the end of the tour, you will brew fresh coffee and enjoy a cup. This is a very nice tour to learn all about coffee. You are also offered to buy some coffee at the end of the tour and you should definitely do this since it’s very cheap and high quality. The tours start every half an hour and you can easily wait for the next tour by sitting in the lovely garden and enjoying the scenery with a cup of coffee in your hand. 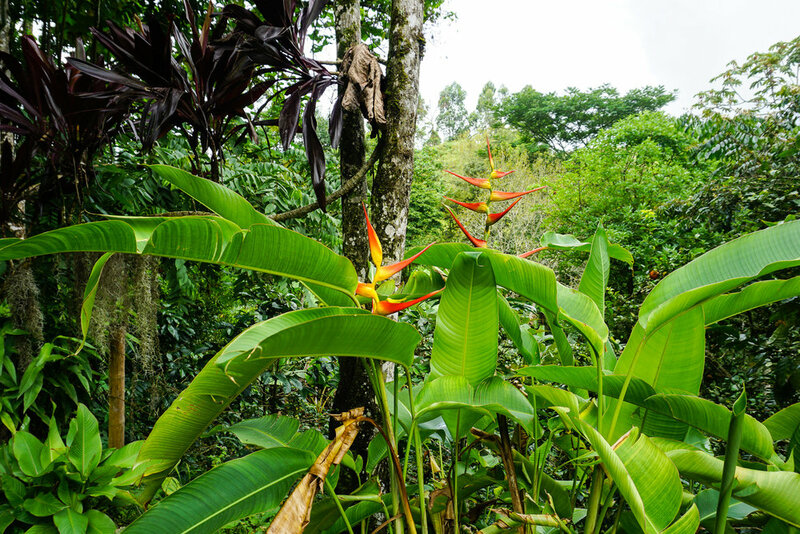 You can reach the coffee farm by taxi, on foot, or on a horse; all these are great options. We walked through the street and got rather bored at first, but to our surprise, we saw quite a lot of birds and animals. You can also enjoy the views of the valley on your right with streams and rivers along the way. I highly recommend the one-way stroll, because it’s easy and not too long – maybe 1-1.5 hours to the centre. You can walk to the coffee farm as it’s all downhill, but best to take a taxi back as it goes uphill. 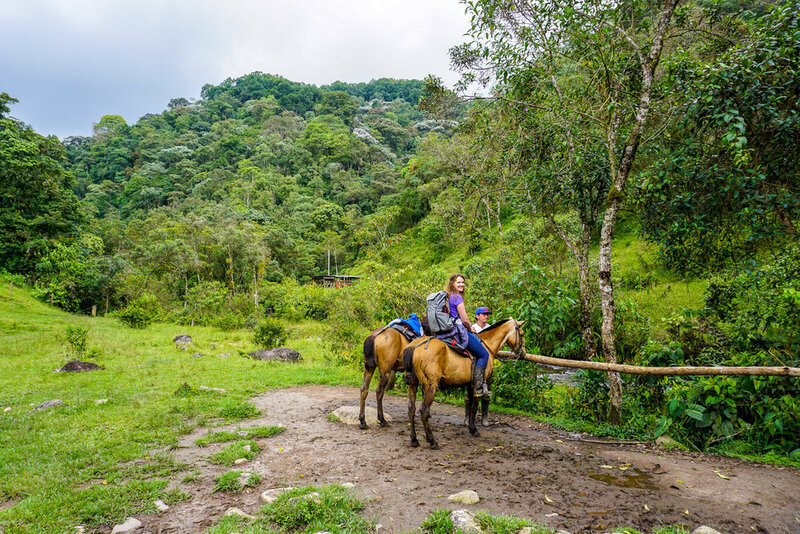 Horseback riding in Colombia is something that all visitors should experience during their trip to this stunning country. In the small town of Salento, it’s not unusual to see people riding horses in town and near the waterfalls. If you can spare a day, go on a horse ride to the waterfall. Although the waterfall itself isn’t particularly special, the horse riding trip is and it’s a nice way to enjoy the beautiful landscape. This was one of my personal highlights for sure and I’m not even a horse girl. You don’t need to have any riding experience to enjoy the trip. I had never been on a horse before but the horses are well-prepared and even carry huge rain covers to protect your whole body from getting wet. I highly recommend that you borrow rubber boots as it’s highly likely to get muddy in the rain. Most accommodations in Salento offer rubber boots. If you’re not used to riding horses, you will more likely feel a lot of pain (in your bottom) afterwards as the journey takes 3-5 hours. But nevertheless, it’s well worth it! 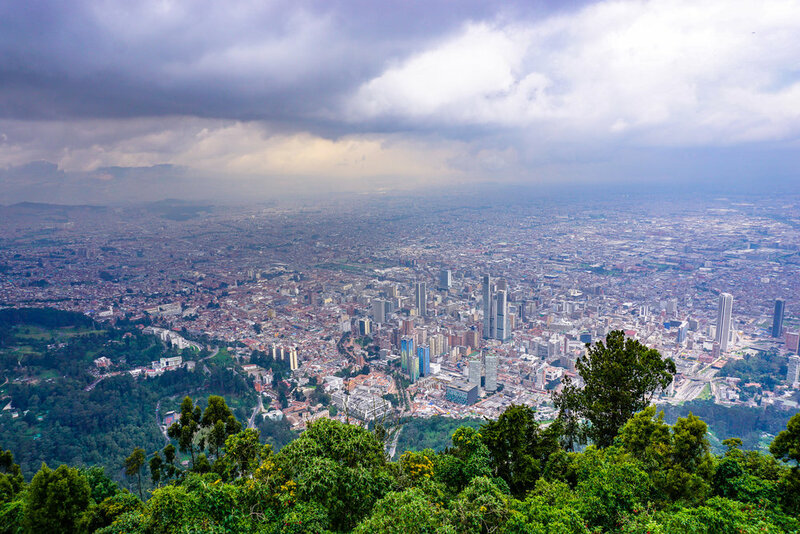 Bogotá is the capital of Colombia and the largest city with over 6.5 million inhabitants. It boasts colonial-style landmarks like the 17th century San Francisco Church and the neoclassical Colón Theatre. Bogotá is diverse and enjoys a blend of contemporary and colonial architecture in a multicultural setting. 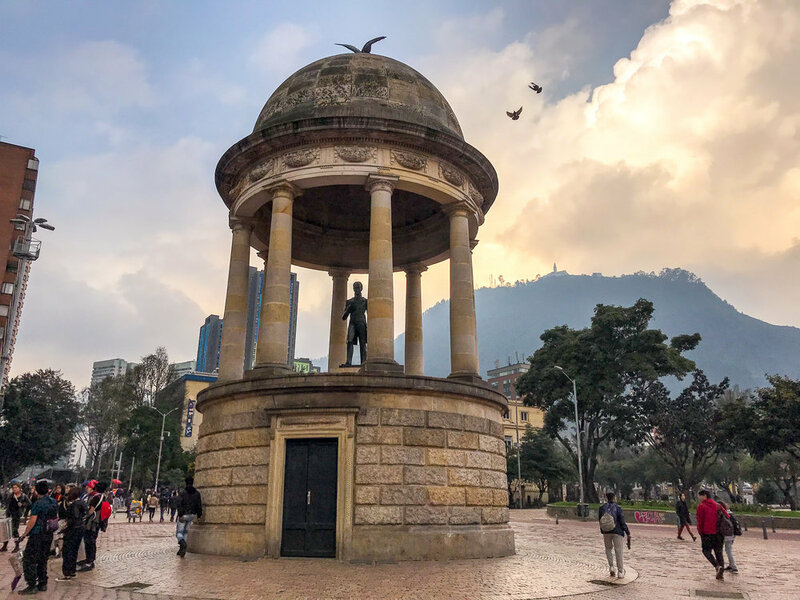 The chic district of Zona Rosa and the cobbled streets of the trendy Candelaria area with plenty of street art and graffiti, as well as the 400-acre parks are some of the top features of this capital city. But there is a lot more to discover about Bogotá, namely Monserrate Mountain, which has fabulous views and is located in the city centre. On top of this mountain, there is an iconic church with a shrine visible from a distant. Visitors interested in this city’s famous street art are recommended to go on a free walking tour to see some of the best graffiti Bogotá has to offer. Budget travellers can spend the night in La Candaleria’s charming Botanico Hostel, with friendly staff and an excellent breakfast. The famous historic downtown area of Bogotá is home to the unique Gold Museum containing over 50,000 gold pieces that date back to many centuries ago. Some of these pieces have been crafted into objects or jewellery by the local communities. There is also a traditional market that takes place every Sunday in the neighbourhood of Usaquen. Here you can find many stalls selling one-of-a-kind handcrafted items. Visiting this market provides a perfect opportunity to walk around the area and learn about the region’s traditional crafts. Colombians are extremely friendly and warm-hearted people. While you may across nice people on your travels to countries like Thailand or Indonesia, for example, Colombians are genuinely and unpretentiously kind to tourists. They will help you anytime, anywhere, without expecting any money from you. In fact, I don’t think I’ve ever met friendlier people than the Colombians. Someone explained to us that one of the reasons why Colombians are such happy people is because they have peace in their country now and don’t see anyone getting killed in the streets anymore. They truly appreciate the peace and freedom they have now. Speaking Spanish is a necessity. If you don’t speak Spanish, you will find it hard to communicate as not everyone in Colombia speaks English. However, they are such lovely people and will go out of their way to help you out. Nevertheless, you will definitely find it easier if you learn some basic Spanish phrases. To my surprise, public transportation proved to be very efficient and there were buses running all the time without delays. In fact, we never had to wait for longer 10 minutes for a bus. You might think that using a taxi from time to time is convenient and cheap, but most of the time, the drivers will only take you as far as the city centre. This happened to us once when we wanted to take a taxi in Santa Marta to the beach. We had a terrible time finding a driver who would be willing to take us there. Although there were plenty of taxis, for some unknown reason none of them wanted to take us. At the end, we had no choice but to catch a bus, which was very easy to do as it stops at every corner. Someone later explained to us that taxis are not allowed to drive beyond the town centre so catching the bus is the easiest option. Uber is available in Colombia but nobody is quite sure whether it is legal or not. We used Uber several times as the prices are fair and you will get picked up from anywhere -but don’t do this at the airport. Some tend to send you a text message asking you to walk to the location they are at before picking you up. It’s easier to just take a cab at the airport. However, you should always find out the price with Uber beforehand so you can haggle with the taxi driver, otherwise you will get ripped off. Always negotiate the price before entering the taxi, otherwise they will come up with a different price. If they use a taximeter then even better. If you’re thinking of renting a car, don’t do it as the country is huge and you won’t need to drive a car. You can always fly to any destination you want with VivaColombia, Avianca, etc..
Avoid the Latam airline as it’s a cargo airline and when their storage facility is full, they won’t take your luggage. Take a look at our comments about the low cost airline VivaColombia by scrolling down this page. Don’t drink the tap water as it’s not clean and up to standard. Some people use SteriPens for filtering water, but I didn’t use it once. Why? Because you can easily buy bottled water anywhere, even during the Lost City trek. However, don’t go crazy by brushing your teeth with bottled water as you can’t swallow the water whilst brushing your teeth anyway. Beach vendors in Colombia are something else! Every second of the day they want to sell you something at a ‘special price’. The only good thing about them is that they are not as annoying or persistent as other countries' street sellers. If you say ‘gracias’ or ‘no gracias’ and shake your head; they will leave you alone. Having said that, there are some sellers that offer useful things like fresh coconut, mango, or other delicious fruits. It is worth trying some of the delicious food and snacks that locals sell all day long on public buses. Make sure you also buy a SIM card! This can be a nightmare as Colombia tourism isn’t as prepared for visitors as other countries. The best option to buy a SIM card is at the airport, but unlike most other countries’ airports that are likely to offer you the worst provider, in Colombia’s airport, they will mostly offer ''Claro'' SIM card. We wanted to buy a SIM card from a good provider in the city of Medellin, but it wasn’t easy at all. We bought Tigo, which offered a maximum 3GB. It was neither cheap nor the best company. What’s more, the sellers don’t understand what we want so it can take forever to buy a SIM card. However, it only took us 10 minutes to buy one with 4GB at the airport. You will be asked to show your passport at the airport. In shops, however, they don’t accept your passport since you will need a local registration number. But some vendors (not all) will just write their own registration number from their ID before selling you a SIM card. While I don’t have any preferences on SIM card providers, I found that Tigo had a better Internet connection even though it was only 3GB and not 4GB like other providers. When your SIM card runs out of gigabytes, you can easily top it up. It costs around COP35.000 - 50.000 and some packages even offer free Facebook and WhatsApp. You must make sure your SIM card allows you to make phone calls as some are offered with Internet connection only. In case your SIM card doesn’t allow you to make calls, there are hotels, hostels, tour companies, and even bus companies that provide their WhatsApp numbers for making calls. It must be said that WhatsApp is very popular in Colombia as everyone makes calls through this app. After all, you can do much more with WhatsApp texts and voice messages than phone calls. There are advantages and disadvantages to VivaColombia airline, some of which I will explain here. Firstly, you need to print your boarding pass as they won’t accept an e-ticket. If you don’t have a printed boarding pass, you can print it at the airport's shop for a small fee as you won't be able to print the tickets at the VivaColombia check-in desk. This can be super annoying and time consuming. To save you time and hassle, it's best to ensure you print your ticket at the accommodation you've been staying. Baggage is the other issue that I want to mention. You are allowed to take hand baggage of up to 6kg and checked baggage of 15 to 20kg. You are not allowed to exceed this allowance – not even by one gram! They do tend to exaggerate the sizes and weights of bags. They will weigh your cabin baggage as well as its size. If you’re even 1cm above the maximum limit, they will charge you for it. If for example you and your friend/partner have booked your tickets together and one of you has a 16kg luggage and the other has 24kg, this will amount to 40kg and you will be charged! The airline doesn’t allow the weight of the two bags to be split between the two of you so each luggage must weigh exactly 20kg and not more. Just to give you another example is when my 7.5kg hand baggage exceeded the 6kg limit, I was fined COP 68,000! VivaColombia is not the only airline flying to small airports across the country like Cartagena or Pereira, but it is one of the cheapest in comparison to other airlines like Avianca, which doesn’t even fly to all the airports and has a stopover in Bogota. By far the quickest way to take domestic flights is through VivaColombia. Tip: If you are not travelling alone, it would make more sense to add a second baggage to one person instead of each person paying for one baggage. It’s not only cheaper, but it’s also easier to argue your case at the check-in by saying that you split the weight of these two bags. Yes! Although Colombia has experienced a troubled past, it is now on the way up. Murder rates have significantly dropped and there has been a big decrease (50%) in kidnappings. This dramatic change and fall in crime rates is thanks to the former President, Uribe, who has taken constructive measures to make Colombia a safer country for visitors and locals. Just as in any other country, you should still be cautious, especially in Bogota or the poor region of Medellin. It’s not wise to walk around with your expensive camera or smartphone. There is no place in this world that’s completely safe so you cannot expect 100% safety in a large and bustling city of Cartagena. However, this doesn’t mean the city is particularly dangerous. Most visitors who have travelled to this part of Colombia haven’t had any negative experiences, but one should still take common sense precautions – no matter where they travel to. In the popular tourist areas of the city, there is little or no chance of coming face-to-face with kidnappings or gang-related violence, but on the outskirts; the reality is different. Which is safer Colombia or Venezuela? It has to be Colombia. According to regional crime index statistics, Colombia is the 6th most dangerous country in Latin America, with Venezuela’s Caracas in the lead as the world’s most dangerous city. Drug-related activity is the main reason for Venezuela’s high crime levels. Colombia, on the other hand, has made a greater effort in heightening security at its borders and ports, which is why there has been a significant drop in its crime rates. Which city in Colombia is most dangerous? According to local media reports, Cali, Colombia’s 3rd largest city is the most violent in the country. The statistics on crime have also confirmed Cali as the most murderous city. The national government has taken constructive action to combat violence in this city by appointing armed forces to patrol the streets and dangerous neighbourhoods. Compared to the rest of Colombia, Cali has not been able to successfully lower its homicide rate because of the high gang activity. What are Colombia's traditions and culture? Colombia is a diverse country that blends the traditions of its indigenous, African, and European roots together while creating new customs at the same time. The traces of Colombian culture go as far back as the 16th century when the Spanish settlers lived in this country. Colombia has many customs and traditions, especially during the festive season. At Christmas, the most typical tradition is to serve a custard dish called natilla and buñuelos, which is fried dough balls. Families attend a Novena and sing carols together in honour of Virgin Mary and Baby Jesus. The Novena prayer sessions are hosted by a different family member or relative on each of the 9 nights before Christmas. Does Colombia have any natural resources? Yes. Natural gas, iron, gold, copper, emeralds, and petroleum, among others. It is estimated to be 47.6 million (June 2017). Where is Colombia located on the world map? Colombia is located in the South American continent and covers approximately 100,120 km of water and 1,038,600 square kilometres of land. This is the 26th biggest nation in the world. Where are the best places to visit in Colombia? Santa Marta on the Caribbean coast, Medellin, the coffee region, the Amazon, Tayrona National Park, the Lost City Trek, Salento, and Bogota, just to name a few. (Refer to our itinerary for more places to visit in Colombia). Where to stay in Colombia? In the chic district of Bogota, La Candelaria offers many large and modern hotels. For more character, the hostels and guesthouses with their charming haciendas and rustic rooms are the ideal accommodations in the capital city. Another great district in Bogota is the arty La Macarena, with many musicians and artists at its every corner. This area has a mix of flats, guesthouses, and top-class hotels situated close to the historic centre. In Medellin’s downtown, El Poblado, you can stay in a safe and peaceful place within easy reach of the top attractions. There is a variety of mid-range to luxury hotels in Medellin’s exclusive district as well as a couple of hostels. Here you will have all the amentities within your reach. The walled city of Cartagena boasts of stunning architecture and you can stay in some of the most beautiful and colourful colonial houses. There are also boutique hotels for surprisingly low prices. How many days is needed to explore Colombia? At least 2 to 3 weeks. As the country is huge and offers plenty to see, you can easily spend a month exploring most of its places. 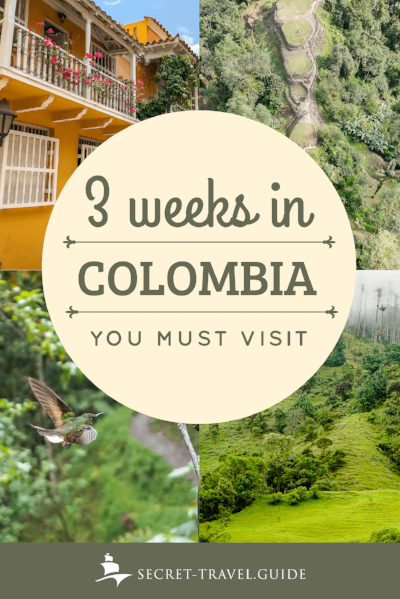 But if you follow our itinerary, you will need a little less than 3 weeks in Colombia. Colombia is much cheaper than Europe or America. When you compare the travel costs of Colombia with other Latin countries, it can be placed around mid-range. While Colombia is more expensive than Bolivia and Nicaragua, it is still cheaper than Chile or Brazil. This is a year-round destination, especially in Medellin and the Caribbean coast, where the weather is warm and comfortable for nearly the entire year. Colombia’s dry season is from December to March, but it does differ from region to region. The main contrasts are in the highlands, where evenings become cold in higher altitude areas. The lowlands enjoy a mild climate with more rain in wetter months of spring and in autumn. What are colombia's major cities? Peru and Ecuador to the south, Venezuela and Brazil to the east, and Panama to the northwest. What is Colombia most famous for? 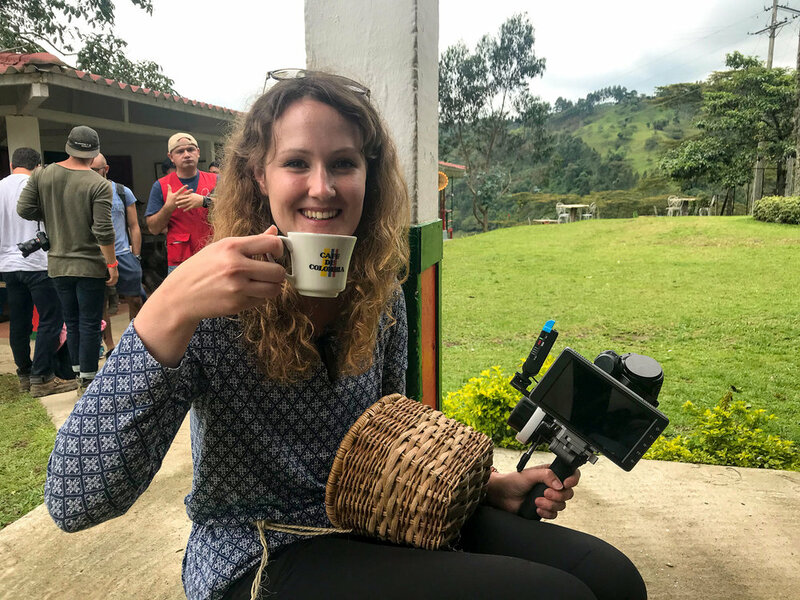 Colombia is famous for its emeralds, tropical landscapes, 60-metre tall palm trees, the El Dorado myth, the Andean peaks, and of course; coffee. What are the biggest landforms in Colombia? A third of Colombia is crossed by three mountain ranges of Andes in the East, Central, and Western part of Cordilleras. The Amazon lowlands extend all the way to the country’s borders with Venezuela and Brazil. Before I travel to Colombia vaccination needed or not? Yellow fever is mandatory and you must get vaccinated at least two months before your flight to Colombia. It wasn’t until 1525 when the Spanish began the colonisation process of Colombia. As a consequence, the country became an official colony of the Spanish empire. What is Colombia’s official currency? How did Colombia gain its independence and who from? In 1810, Colombians took to the streets and protested against Spanish rule. Although the Viceroy had no option but to allow limited independence, it later became permanent and today, every July 20th, Independence Day is celebrated by the Colombians. This South American officially gained its sovereignty from Spain in 1819. The very first Spaniard who landed in Colombia in 1500 was Alonso de Ojeda. But there was no settlement by the Spanish until 1533 when Santa Marta and Cartagena were discovered. For thousands of years before, the American Indians lived in what’s now called Colombia. Some of these natives survived by fishing, farming, and hunting. What are Colombia's flag colours? The national flag is a horizontal tri-colour of yellow, red, and blue. What are Colombia's geographical features? Colombia is on the coast of the Pacific and Atlantic oceans and its geographical features cover about 1.14 million square kilometres. The lowland coastal regions are home to rainforests and the Andes. Colombia consists of a series of small islands in the Atlantic and in the Pacific, which have been marked as natural wildlife reserves. What language is officially spoken in Colombia? Which are Colombia's most important river and why? The most important rivers are Magdalena, the Amazon, and Caqueta. These rivers have a special drainage system and play an important role in the lives of Colombians. Millions of people who live alongside these rivers, including fishermen, benefit from these waters. In addition to supplying fish and water to people, these rivers maintain an eco-system that helps create the ideal environments for plants and animals. The Andean condor is Colombia’s national animal and one of the world’s biggest birds of prey (weighing up to 50 kilos) with wings that span up to 10 feet. What is Colombia's climate like? The temperatures in Colombia are extremely varied. They range from very hot to relatively cold at sea level. Rainfall occurs during two wet seasons in spring and autumn. However, the amount of rainfall depends on the location. The highest levels of rainfall are in Colombia’s Pacific coast and the southeast region also gets drenched in more than 600 cm of rain per year. What religion are the Colombians? 79% of the population are Roman Catholics, and the remaining are Protestants. What souvenirs can I buy in Colombia? Coffee is a must as Colombia is one of the world’s biggest coffee producers. When you visit a coffee farm, you can sample the delicious coffee and take a bag or two with you. Another famous and popular product in Colombia is the mochila shoulder bag woven by the natives of the Guajira Peninsula desert. Why is Colombia such a happy country? Colombia is the world’s second happiest country according to a recent survey conducted by Gallup. Up to 80% of Colombians say they are happy with their country’s situation and more than 46% believe their life will change for the better this year due to lower levels of crime. The level of optimism among Colombians is 6 times higher than their Latin neighbours and 9 times higher than the global average. What should I pack before travelling to Colombia?